Recently I've been getting a lot of feedback regarding my '3 ways to wear a headscarf' video. On YouTube, lots of my amazing viewers have warmed my heart with the lovely comments, then, on Twitter, a lot of negative feedback. Actually, borderline plain ignorant and damn right rude. I'm fed up of seeing this negativity on my twitter feed, what better way to release my fury than into a blog post? First of all, I LOVE wearing a headscarf. All kinds of headscarves. In all kinds of styles. As many other humans in this world do too. From ALL different cultural backgrounds. I was recently requested to film a tutorial on how I like to wear them since many others wanted to do so too. I'm SO done with this 'oh that's OUR thing' OUR?? WHO'S OUR? and then there's those who are simply shitting all over it and blindly fueling backwards steps into segregation. which can I just add, I believe is total bull crap. Only the most brain washed humans of this earth will buy into that. It's funny because a lot of people that are giving me stick for wearing a headscarf are probably the ones that are sick of their culture for not being treated equally, make any sense to you? Nope, course it doesn't. "Oh wait, you're wearing jeans? Jeans?? Oh man, but you're not a cowboy?" No, just no, that wouldn't be said now would it? So why should the likes of a HEADSCARF (as in a piece of material that people tend to wear around their head) be treated in this way? I was recently told that I shouldn't be wearing one because of my race, oh and because I'm not suffering from a hair disease. Oh right. Does that just rule out a piece of material for good then? of something they perceive to be THEIR culture? (which for the record, headscarves are not) Don't believe me? Check out the picture above. I will continue to wear what I want, as you should do too. I'm not going to stand for people giving me crap over social media for something as simple as a headscarf. We are all EQUAL. 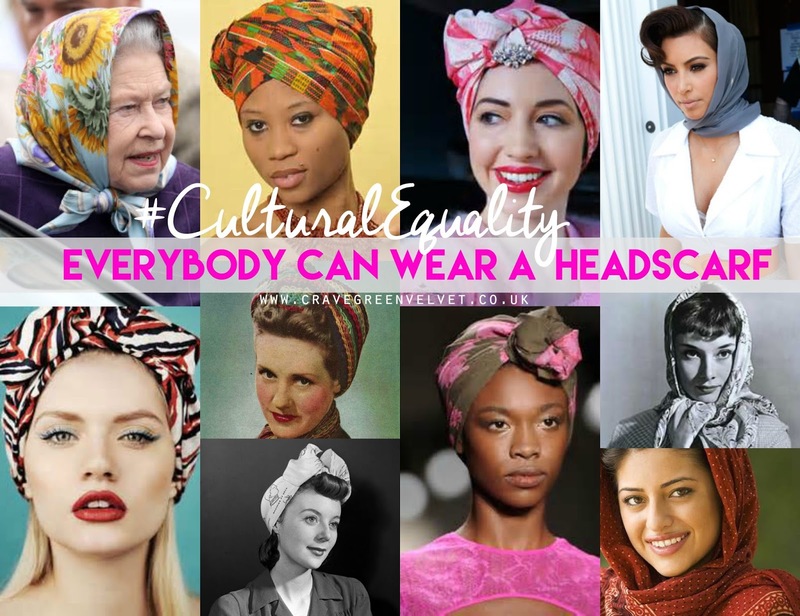 Yes, E Q U A L.
You're absolutely right about the headscarves! But please list the correct source of the images you used (photographer or website), Google doesn't own them. "This isn’t a matter of telling people what to wear. It’s a matter of telling people that they don’t wear things in a vacuum and there are many social and historical implications to treating marginalized cultures like costumes."